Both Lance and James Morcan have done an amazing job with this incredible story. Being based on a true story, made it that much more interesting. One of the standouts is how well they explained how hard the white settlors and convicts had it back in the 1800’s. Some of the convicts went through hell, and all for stealing a loaf of bread. The Authors have really brought this story alive with some amazing characters and splendid writing. With no supermarket or corner store in the 1800’s Moilow stood for hours like an unmoving statue waiting for a kangaroo to drink from the waterhole. This was the patience required to hunt and catch food for his tribe in the Australian bush. The soldiers of the Penal Colony had it a little easier when it came to food, and they were smart in employing the services of Barega an Aboriginal Tracker. He was the main reason they had such success in tracking down escaped convicts. That and because they were a long way from civilisation. Morton Bay Penal Colony definitely wasn’t a place you wanted to end up in as a convict. Lord Bertram Cheetham was the man in overall charge, and he probably let the power go to his head a bit too much. He ruled with an iron fist, and he demanded punishments were dished out in the harshest imaginable terms. Although he wasn’t quite with it most of the time as he likes his Gin and Opium a bit too much. It was because of Cheetham’s hard-line approach that Captain Marsden his second in charge believed there were so many escape attempts by the convicts. The prisoners had very little to eat, and their cramped living conditions were deplorable. Then add in the 16 hour working days in the quarry, which was tough going. Especially if you were exhausted or sick as most of the men were. Young Helen Marsden certainly has her admirers. With not many women around, and certainly none as beautiful as she is. Lieutenant Hogan isn’t the only one showing a keen interest in her. Helen is becoming quite outspoken and is beginning to put her two cents worth in around the colony. As soon as John Graham arrives in Morton Bay, he is already counting how many guards there are, and planning an escape. He is much smarter than the average man, and he knows if he is caught, then he will face death at the gallows. Helen begins to write a newspaper column, and it makes her father very angry when she writes of the atrocities that are happening at the penal colony. Her father doesn’t realise it yet, but one of the convicts is hopefully going to rescue his daughter. This was such a captivating story, and it made for a few very enjoyable days of reading. I would definitely recommend it. I absolutely loved this book it's now in my top two best reads. The characterization was amazing and because it told a lot of the indigenous history of Queensland, very close to where I'm living, it was quite moving and personal. An amazing insight into the lives of our first peoples. I believe it stuck very much to the true story with, of course, some literary licence which only enhanced the reading. I have told all my friends who love a good read about this book with a high recommendation to put it on their book list. I have since researched some of the true story. I have added these authors to my must read list. It is a very long book but had me hooked at every page. I am currently reading "Into the Americas", another book by these authors highlighting further indigenous history. A real gem of a find. Great story and well written, just one major bugbear of mine, and it is not confined to this novel, but many others. There is a misunderstanding about grammar use. To many it is not major, but when the error is so obvious it does grate when people do not seem to get it. A person may be 'hanged'. They can NEVER be 'hung'. A picture can be hung and a picture may be hanged, but a person can never be 'hung', they can only ever be hanged - always. A story in the 19 century where this is a constant reference can be particularly irritating. 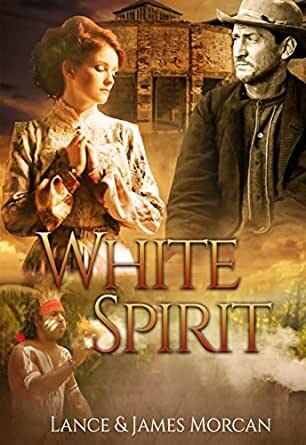 White Spirit is an exceptionally well crafted novel that recreates the dramatic and dualistic world of opposites that typified the early years of colonial Australian settlement. The authors also give us a taste of the sheer beauty and harshness of the Australian landscape. The characters are very well crafted and reflect the opposing ways of life that permeated this time. I normally wouldn’t read a book this long but once I’d started I really couldn’t stop. The authors do a fine job weaving a fictional story out of the facts. It’s not one for the squimish but these were tough times in a tough environment. A good mix of characters to love and loathe and a satisfactory conclusion. What more do you want? Eye opening. Fascinating insight into the first Australian settlements.